The second season of the Schubert on the Bluff series, under the artistic direction of David Allen Wehr, concluded on Saturday, February 19th. 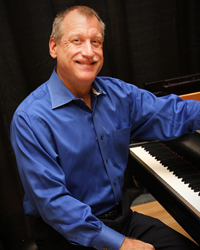 Wehr is the holder of the Jack W. Geltz Distinguished Piano Chair at Duquesne. This year's On the Bluff series featured the music of Aaron Copland, including song cycles, chamber works, and intimate works for soloist and piano alike. PNC Recital Hall was filled with the sounds of Duquesne University faculty, musicians of the Pittsburgh Symphony Orchestra, and several guest artists. This season's increased attendance resulted in a pre-sold out concert, the first in the history of the series. Artistic director David Allen Wehr says, "I am thrilled by the continuing audience response to the Schubert on the Bluff concerts and am honored that the work my colleagues and I are doing is now considered a "hot ticket" in Pittsburgh, according to the Pittsburgh Post-Gazette." Plans are underway for scheduling six Schubert on the Bluff, Year Three concerts, which will feature Claude Debussy as guest composer. Details will be forthcoming as soon as dates are confirmed. In the meantime, Wehr is proud to direct the second annual Summer Music on the Bluff concert, which will be the weekend before Memorial Day, Saturday, May 20 at 4:30 p.m. in PNC Recital Hall. This concert will feature the Pittsburgh Symphony Orchestra's Principal Flutist, Lorna McGhee, joined by Joe Utterback (jazz piano) and Duquesne faculty members Bill Purse (bass guitar) and Tom Wendt (percussion). Repertoire will include works by Schubert and Claude Bolling. For more information on the Schubert on the Bluff series, visit duq.edu/schubert.